For giant fennel, see Ferula communis. For sea fennel, see Crithmum. Not to be confused with Nigella sativa, also called fennel flower. 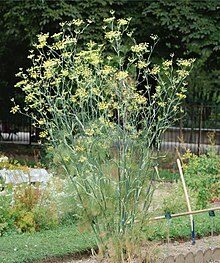 Fennel (Foeniculum vulgare) is a flowering plant species in the carrot family. It is a hardy, perennial herb with yellow flowers and feathery leaves. It is indigenous to the shores of the Mediterranean but has become widely naturalized in many parts of the world, especially on dry soils near the sea-coast and on riverbanks. Foeniculum rigidum Brot. ex Steud. Ozodia foeniculacea Wight & Arn. Tenoria romana Schkuhr ex Spreng. It is a highly aromatic and flavorful herb used in cookery and, along with the similar-tasting anise, is one of the primary ingredients of absinthe. Florence fennel or finocchio is a selection with a swollen, bulb-like stem base that is used as a vegetable. Fennel is used as a food plant by the larvae of some Lepidoptera species including in its native range the mouse moth and the Old-World swallowtail. Where it has been introduced in North America it may be used by the anise swallowtail. The Greek name for fennel is marathon (μάραθον) or marathos (μάραθος), and the place of the famous battle of Marathon literally means a plain with fennel. The word is first attested in Mycenaean Linear B form as ma-ra-tu-wo. As Old English finule, fennel is one of the nine plants invoked in the pagan Anglo-Saxon Nine Herbs Charm, recorded in the 10th century. In the 15th century, Portuguese settlers on Madeira noticed the abundance of wild fennel, and used the Portuguese word funcho (fennel) and the suffix -al to form the name of a new town, Funchal. Fennel, Foeniculum vulgare, is a perennial herb. It is erect, glaucous green, and grows to heights of up to 2.5 metres (8 ft), with hollow stems. The leaves grow up to 40 centimetres (16 in) long; they are finely dissected, with the ultimate segments filiform (threadlike), about 0.5 millimetres (1⁄50 in) wide. (Its leaves are similar to those of dill, but thinner.) The flowers are produced in terminal compound umbels 5–15 centimetres (2–6 in) wide, each umbel section having 20–50 tiny yellow flowers on short pedicels. The fruit is a dry schizocarp from 4–10 millimetres (3⁄16–3⁄8 in) long, half as wide or less, and grooved. Since the seed in the fruit is attached to the pericarp, the whole fruit is often mistakenly called "seed". Fennel is widely cultivated, both in its native range and elsewhere, for its edible, strongly flavored leaves and fruits. Its aniseed flavor comes from anethole, an aromatic compound also found in anise and star anise, and its taste and aroma are similar to theirs, though usually not as strong. Florence fennel (Foeniculum vulgare Azoricum Group; syn. F. vulgare var. azoricum) is a cultivar group with inflated leaf bases which form a bulb-like structure. It is of cultivated origin, and has a mild anise-like flavor, but is sweeter and more aromatic. Florence fennel plants are smaller than the wild type. The inflated leaf bases are eaten as a vegetable, both raw and cooked. Several cultivars of Florence fennel are also known by several other names, notably the Italian name finocchio. In North American supermarkets, it is often mislabeled as "anise". Foeniculum vulgare 'Purpureum' or 'Nigra', "bronze-leaved" fennel, is widely available as a decorative garden plant. Fennel has become naturalized along roadsides, in pastures, and in other open sites in many regions, including northern Europe, the United States, southern Canada, and much of Asia and Australia. It propagates well by seed, and is considered an invasive species and a weed in Australia and the United States. In western North America, fennel can be found from the coastal and inland wildland-urban interface east into hill and mountain areas, excluding desert habitats. Florence fennel is one of the three main herbs used in the preparation of absinthe, an alcoholic mixture which originated as a medicinal elixir in Switzerland and became, by the late 19th century, a popular alcoholic drink in France and other countries. Fennel fruit is also used in the production of akvavit. A 100-gram portion of fennel fruits provides 1,440 kilojoules (345 kilocalories) of food energy, and it is a rich source (more than 19% of the Daily Value, DV) of protein, dietary fiber, B vitamins and several dietary minerals, especially calcium, iron, magnesium and manganese, all of which exceed 100% DV (table). Fennel fruits are 52% carbohydrates, 15% fat, 40% dietary fiber, 16% protein and 9% water (table). The bulb, foliage, and fruits of the fennel plant are used in many of the culinary traditions of the world. The small flowers of wild fennel (known as fennel "pollen" ) are the most potent form of fennel, but also the most expensive. Dried fennel fruit is an aromatic, anise-flavored spice, brown or green in color when fresh, slowly turning a dull grey as the fruit ages. For cooking, green fruits are optimal. The leaves are delicately flavored and similar in shape to those of dill. The bulb is a crisp vegetable that can be sautéed, stewed, braised, grilled, or eaten raw. Young tender leaves are used for garnishes, as a salad, to add flavor to salads, to flavor sauces to be served with puddings, and also in soups and fish sauce. Fennel fruits are sometimes confused with those of anise, which are similar in taste and appearance, though smaller. Fennel is also used as a flavoring in some natural toothpastes. The fruits are used in cookery and sweet desserts. Many cultures in India, Afghanistan, Iran, and the Middle East use fennel fruits in cooking. It is one of the most important spices in Kashmiri Pandit and Gujarati cooking. It is an essential ingredient of the Assamese/Bengali/Oriya spice mixture panch phoron and in Chinese five-spice powders. In many parts of India, roasted fennel fruits are consumed as mukhwas, an after-meal digestive and breath freshener, or candied as comfit. Fennel leaves are used in some parts of India as leafy green vegetables either by themselves or mixed with other vegetables, cooked to be served and consumed as part of a meal. In Syria and Lebanon, the young leaves are used to make a special kind of egg omelette (along with onions and flour) called ijjeh. Many egg, fish, and other dishes employ fresh or dried fennel leaves. Florence fennel is a key ingredient in some Italian and German salads, often tossed with chicory and avocado, or it can be braised and served as a warm side dish. It may be blanched or marinated, or cooked in risotto. Fennel fruits are the primary flavor component in Italian sausage. In Spain, the stems of the fennel plant are used in the preparation of pickled eggplants, berenjenas de Almagro. 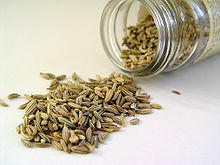 An herbal tea or tisane can be made from fennel. On account of its aromatic properties, fennel fruit forms one of the ingredients of the well-known compound liquorice powder. In the Indian subcontinent, fennel fruits are also eaten raw, sometimes with a sweetener. In Israel, fennel salad is made of chopped fennel bulbs flavored with salt, black pepper, lemon juice, parsley, olive oil and sometimes sumac. As grouped by the United Nations Food and Agriculture Organization, production data for fennel are combined with similar spices – anise, star anise, and coriander. In 2014, India produced 60% of the world output of fennel, with China and Bulgaria as leading secondary producers (table). Many species in the family Apiaceae or Umbelliferae are superficially similar to fennel, and some, such as poison hemlock, are toxic, so it is unwise, and potentially extremely dangerous, to use any part of any of these plants as an herb or vegetable unless it can be positively identified as being edible. Dill, coriander, and caraway are similar-looking herbs, but shorter-growing than fennel, reaching only 40–60 cm (16–24 in). 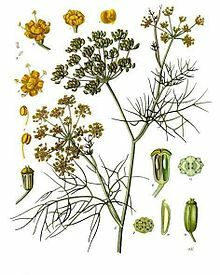 Dill has thread-like, feathery leaves and yellow flowers; coriander and caraway have white flowers and finely divided leaves (though not as fine as dill or fennel) and are also shorter-lived (being annual or biennial plants). The superficial similarity in appearance between these may have led to a sharing of names and etymology, as in the case of meridian fennel, a term for caraway. Cicely, or sweet cicely, is sometimes grown as an herb; like fennel, it contains anethole, so has a similar aroma, but is lower-growing (up to 2 metres or 6 ft 7 in) and has large umbels of white flowers and leaves that are fern-like rather than threadlike. Giant fennel (Ferula communis) is a large, coarse plant, with a pungent aroma, which grows wild in the Mediterranean region and is only occasionally grown in gardens elsewhere. Other species of the genus Ferula are also commonly called giant fennel, but they are not culinary herbs. In North America, fennel may be found growing in the same habitat and alongside natives osha (Ligusticum porteri) and Lomatium species, useful medicinal relatives in the parsley family. Most Lomatium species have yellow flowers like fennel, but some[which?] are white flowered and resemble poison hemlock. Lomatium is an important historical food plant of Native Americans known as 'biscuit root'. Most Lomatium spp. have finely divided, hairlike leaves; their roots have a delicate rice-like odor, unlike the musty odor of hemlock. Lomatium species tend to prefer dry rocky soils devoid of organic material. The aromatic character of fennel fruits derives from volatile oils imparting mixed aromas, including trans-anethole and estragole (resembling liquorice), fenchone (mint and camphor), Limonene, 1-octen-3-ol (mushroom). Other phytochemicals found in fennel fruits include polyphenols, such as rosmarinic acid and luteolin, among others in minor content. ^ The Plant List, Foeniculum vulgare Mill. ^ "Classification for Kingdom Plantae Down to Genus Foeniculum Mill.". US Department of Agriculture, Natural Resources Conservation Service. 2015. Retrieved 24 March 2015. ^ μάραθον. Liddell, Henry George; Scott, Robert; A Greek–English Lexicon at the Perseus Project. ^ Μαραθών in Liddell and Scott. ^ On tablets MY Ge 602, MY Ge 606 + fr., MY Ge 605 + 607 + frr. + 60Sa + 605b. "The Linear B word transliterated as ma-ra-tu-wo". Palaeolexicon. Word study tool of Ancient languages. Raymoure, K.A. "ma-ra-tu-wo". Minoan Linear A & Mycenaean Linear B. Deaditerranean. "MY 602 Ge (57)". "MY 606 Ge + fr. (57)". "MY 605 Ge + 607 + fr. [+] 60Sa + fr. [+] 605b + frr. (57)". DĀMOS: Database of Mycenaean at Oslo. University of Oslo. ^ "Old English Plant Names". Retrieved 2013-01-16. ^ "Foeniculum vulgare". Germplasm Resources Information Network (GRIN). Agricultural Research Service (ARS), United States Department of Agriculture (USDA). Retrieved 2017-12-10. ^ "Green Fennel Seeds". Retrieved 2014-06-24. ^ Rombauer, Irma (1997). Joy of Cooking. New York: Simon & Schuster Inc. p. 375. ISBN 978-0-684-81870-2. ^ Ziedrich, Linda. The Joy of Pickling. 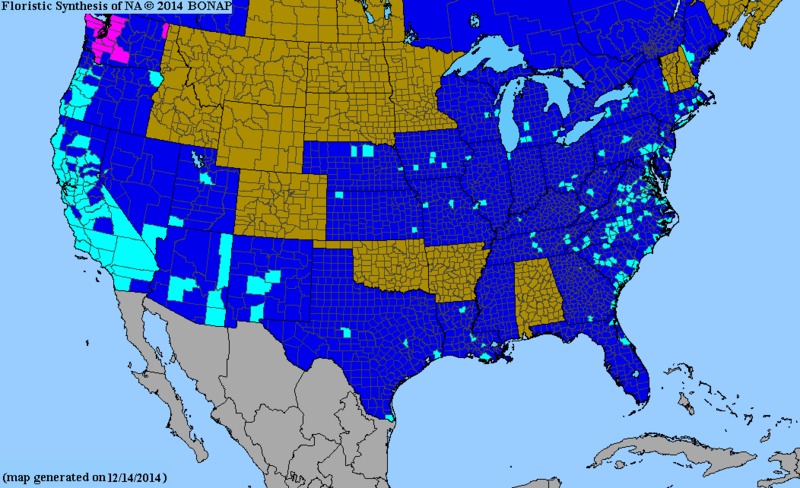 ^ "Biota of North America Program 2014 county distribution map". ^ "Aalborg Taffel Akvavit". www.diffordsguide.com. Retrieved 8 November 2017. ^ Drinkers, The Thinking (8 November 2016). "Aquavit: this winter's hottest spirit". The Telegraph. www.telegraph.co.uk. Retrieved 8 November 2017. ^ "Fennel Pollen: Culinary Fairy Dust". The Wall Street Journal. 23 March 2012. ^ a b M. G. Kains (1912). American Agriculturist, ed. Culinary Herbs: Their Cultivation Harvesting Curing and Uses. Orange Judd Company. Archived from the original (English) on 13 April 2017. ^ Deepika Sahu (10 May 2012). "The power of five seeds". The Times Of India. ^ "Fennel Tea Benefits". 9 March 2014. ^ a b "Production in 2014, Crops/Regions/World list/Production Quantity (pick lists)". UN Food and Agriculture Organization, Corporate Statistical Database (FAOSTAT). 2017. Retrieved 10 November 2017. ^ Badgujar, Shamkant B.; Patel, Vainav V.; Bandivdekar, Atmaram H. (2014). "Foeniculum vulgareMill: A Review of Its Botany, Phytochemistry, Pharmacology, Contemporary Application, and Toxicology". BioMed Research International. 2014: 1–32. doi:10.1155/2014/842674. ISSN 2314-6133. PMC 4137549. PMID 25162032. ^ Díaz-Maroto, M. C; Díaz-Maroto Hidalgo, I. J; Sánchez-Palomo, E; Pérez-Coello, M. S (2005). "Volatile components and key odorants of fennel (Foeniculum vulgare Mill.) and thyme (Thymus vulgaris L.) oil extracts obtained by simultaneous distillation-extraction and supercritical fluid extraction". Journal of Agricultural and Food Chemistry. 53 (13): 5385–9. doi:10.1021/jf050340. PMID 15969523. ^ Uusitalo, L; Salmenhaara, M; Isoniemi, M; Garcia-Alvarez, A; Serra-Majem, L; Ribas-Barba, L; Finglas, P; Plumb, J; Tuominen, P; Savela, K (2016). "Intake of selected bioactive compounds from plant food supplements containing fennel (Foeniculum vulgare) among Finnish consumers". Food Chemistry. 194: 619–25. doi:10.1016/j.foodchem.2015.08.057. PMID 26471600. Chisholm, Hugh, ed. (1911). "Fennel" . Encyclopædia Britannica (11th ed.). Cambridge University Press.